TigerBlog heard from Scott Jurgens yesterday. He thanked TB for the mention yesterday, about he and another former Princeton Athletics staffer, Mary Gleason, have been dealing with Hurricane Harvey. "It's funny that last week we were not supposed to look at the sun and now we have never been so happy to see it." Doesn't that sum everything up pretty much perfectly? TB really hopes Scott came up with that himself. Regardless, it's nice to see that the sun has come out down there. That's not really what TigerBlog wanted to talk about today. In fact, anything that TB would talk about pales in comparison to what's going on in Houston, so he feels a little guilty talking about something that doesn't measure up, like what happened around here yesterday. It was Nike day, the day when athletic department staff is issued its annual gear for the coming academic year. Yes, it's a nice perk of working here. To TigerBlog, it represents a lot more than just that, though. The effect off the Nike deal on all of Princeton Athletics has been nothing short of extraordinary. 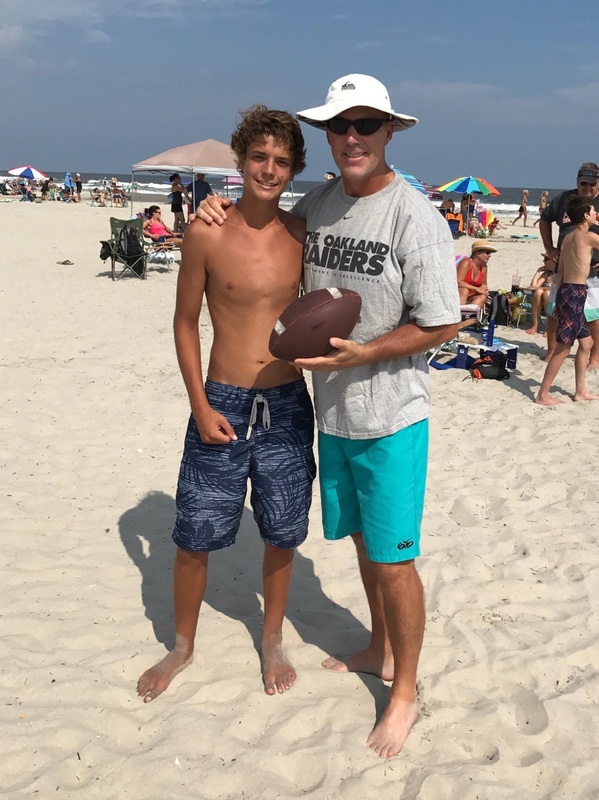 What started out as a bit of a perk has turned into the single best element of what has come to be know around here as "overt pride," something that stretches across every coach, athlete and staff member of the department - and even outside the department. When TigerBlog first started working here, there were different color oranges, there were different brands, there were different everything. And it led to something that he used to see all the time and almost never sees anymore - the sight of Princeton athletes on this campus wearing gear from other colleges. Now, Princeton's teams look like teams. They look uniform. They wear the same colors, with the same designs. They have the same fonts. It sounds so simple, but it's a huge thing. It leads to feeling like you're part of something larger than just your spot on your team. It leads to being part of the larger Princeton Athletics family. It leads to feeling proud. TigerBlog firmly believes that the uniform look that Princeton teams have, on their teams and across the department, has a positive impact on the field. Maybe it doesn't make the difference in the final moments of a close game, but in general, TB thinks that an athletic department works better when everyone feels that they are fully invested in it. For TigerBlog, that understanding means more than the new gear itself, though he certainly appreciates what he gets. With yesterday's allotment, TB was given the choice between a hat or a visor. He went with the hat. He never understood the whole visor thing. It doesn't cover your whole head, for one thing. This becomes an even bigger deal if, like TigerBlog, it's possible that your hair has thinned just the slightest on top. Also, it's like one of those winter jackets that has no sleeves. Why do people get those? The new sneakers are also great. They're gray, with black laces. TigerBlog has a pair like that from two years ago that are pretty beaten up, but the gray does stay cleaner than white. TigerBlog, by the way, has not bought a pair of sneakers in 25 years or so. The men's water polo team opens its season this weekend in a tournament at Navy, which is, by the way, the alma mater of Princeton head coach Luis Nicolao. The members of the team came in yesterday for their head shots, following the parade of the other fall teams who have already been here. Each member of the team came in wearing a black Nike longsleeve dri-fit with a white Swoosh, a white P and white lettering of "water polo." They looked exactly how a team is supposed to look. You know that carries over on the field, or in their case, the pool. TigerBlog read the other day that more than nine trillion gallons of water had fallen on the greater Houston area as a result of Hurricane Harvey. He can't remember ever reading about a storm in terms of the gallons of water that fell, so he's not sure where other major rainfalls end up, or even an average rain, like the one that fell in Princeton yesterday. He did a search for it, and what it said was that one inch of rain that falls over one acre of land brings with it 27,154 gallons of water. If you want to factor that out to nine trillion, it gives you a sense of what's going on down there. And actually that was a few days ago. The rainfall has pretty much doubled since then. The pictures from the flooding there have been horrific. The stories of the loss of life have been even more tragic. The pictures of the rescue efforts, on the other hand, have been nothing short of heroic. There have been shots of parks or roads before the rain and since it started, and they hardly look like the same place. TigerBlog has experienced flooding around here at various times, but nothing remotely close to what's going on down there now. TigerBlog reachd out to Scott Jurgens and Mary Gleason the other day, to see how they were doing. Scott used to be the marketing director here at Princeton and, after stops at East Carolina and Montana State, now has the same position at Rice, in Houston. Mary is a former Princeton women's basketball assistant coach, who would become the head coach at Houston Baptist and now is a high school coach in the area. TB: "How fast is this thing going? 70? 80?" As far as Scott and transportation when he was here, he went with a blue car that, as TB recalls, was missing a door or something. Maybe not a door, but it was pretty beaten up. Both Scott and Mary have been lucky, since they've been pretty removed from the major flooding. Mary's brother Joe works for a TV station down there as a sports producer, and he did a live remote from his flooded house on television that enabled him and his family to be rescued. As for Scott, he and his dog Barnaby are also safe. He's actually been able to get out and around a little, getting to work. And has taken pictures of flooded areas. Scott. Not Barnaby. It's hard for TigerBlog to believe that there is a dog anywhere who's ever been photographed more than Barnaby has, ever since Scott got him as a rescue while he was still at Princeton. Pretty much every day there's another picture on Scott's Twitter of the dog. TB is pretty sure he's seen Barnaby actually roll his eyes at the idea of getting another picture taken. Scott and Mary were Jadwin Gym regulars for awhile, though they didn't overlap. Mary left just before Scott arrived back in 2007, and then Scott left in 2011. Mary is the all-time leader in three-pointers made at SMU, so she was a high draft pick in lunchtime basketball when she played. Scott? He, well, he has a heart of gold, a really strong work ethic and a great sense of humor. TB can't remember ever seeing him shoot a basketball, though he assume he isn't very good at it. TigerBlog is glad they're doing well down there. Hopefully the waters recede, and the long process of cleaning up and getting life back to normal there can get underway. And it was nice to check with both of them. TigerBlog mentioned that Richard Barron, the head coach when Mary was an assistant, had stopped by a few days ago, and Mary mentioned the health problems that he's had, and how his wife, former Princeton softball player and then coach Maureen is a saint. That was obvious. TigerBlog hasn't really talked to Mary much through the years. He's tried to stay more in touch with Scott, who will text every now and then and ask TigerBlog how it's going, always calling him "my friend." TB is happy for Scott that he's at a place like Rice. He just hopes the weather gets better there soon. As he says, it was nice to hear from them. Hopefully, next time it won't be to check and see if they're in the heart of an epic, and very much life threatening, flood. "I Do. For GoPrincetonTigers.Com, This Is Cody Chrusciel"
If you're reading this, then odds are good you've heard Cody Chrusciel's voice. Cody, in his two years at Princeton, has been the broadcaster for Princeton football and men's lacrosse on the radio and then basically every other sport that Princeton has on the Ivy League Network. Whenever someone is needed to fill in, on jumps Cody. When TigerBlog interviewed Cody for his position in multimedia, he came away impressed with his experience, ability and references. And voice. Definitely his voice. TigerBlog has done a lot of radio and public address. He uses different voices for both, and neither is exactly his every day speaking voice, if that makes sense. 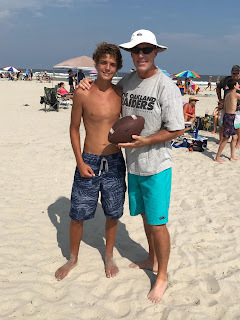 TB was talking the other day to Tom McCarthy, the former Princeton announcer and now the TV voice of the Philadelphia Phillies, as well as the NFL and NCAA basketball. Tom's regular speaking voice isn't exactly his broadcasting voice. Cody, though, talks like a broadcaster at all times. It's unique. It's like TB or McCarthy are imitating broadcasters or anything. It's most about elongating how you speak or the cadence of your voice that changes a bit. Not with Cody. He's always the same. And so there was Cody, Friday night, as he prepared to marry longtime girlfriend Justine Nothstein, who is now Justine Chruschiel. When it comes time to exchange vows, your average groom speaks with a soft, low, serious voice. When it was Cody's turn, he used the same Cody voice that you hear all the time. He might as well have said "Holuba on the tackle, and I do" or "I do. For goprincetontigers.com, this is Cody Chrusciel." TigerBlog wishes Cody and Justine nothing but the best. They had a very nice wedding. TB was happy to be a small part of it. Of course, Cody scheduled his wedding for the same exact moment as the first athletic event of the 2017-18 season, the women's soccer team's 3-0 win over Monmouth Friday night. The guest list - for the wedding, not the game - included John Bullis, Princeton's other multimedia person. This led to the obvious question of "how is the women's soccer game going to be videostreamed?" You know, if Cody was getting married and Bullis was there to be part of it, who would be doing the streaming for the Ivy League Network. By the way, for 2017-18, it's now the Ivy League Network, not the Ivy League Digital Network. Most broadcasts are set up well in advance and can then be trouble-shot remotely should something come up. And that's exactly what happened Friday night. The wedding was supposed to start at 6:30 but began a bit late. The game was at 7. Bullis was monitoring the ILN feed and found that there was a small problem. It wasn't working. In fact, Bullis was trying to solve the problem from his phone as the wedding processional made its way down the aisle. TigerBlog suggested that Bullis simply grab Cody as he came by and ask him if he had any ideas. Knowing Cody like TB does, he would have simply paused, fixed it and then gotten married. In the end, Bullis was able to solve it (something about finding the compatible cord) just around the time the officiant was comparing true love and dog ownership. It had something to do with Cody and Justine's dog, who was represented there by a cardboard cutout. It was cute. Oh, and in addition to fixing the ILN issue from about 30 miles away, Bullis also turned out to be quite the entertaining dancer. He's pretty good at it, and he has a certain degree of, let's call it, flair on the floor. The Office of Athletic Communications has seven people on staff. Cody, Bullis, TigerBlog and four others who cover sports and write the stories that you read on goprincetontigers.com. As Cody was getting married, there were six of them there, with the seventh - Andrew Borders - having to cover the women's soccer game. During the wedding ceremony itself, there was back and forth about making sure a videostream was working. That's how it is in the athletic communications world. Princeton is lucky. It has a really good group of people who are dedicated to what they do. So congratulations to Cody and Justine. They had a really nice wedding Friday night, on a really nice night. All that's left is to have a great life together. There have been few major sporting events through the years that TigerBlog has cared about less than the Mayweather-McGregor fight the other night. Mayweather won, apparently. And he made $100 million. McGregor, for his part, got $30 million. Boxing, of course, used to be one of the two biggest sports in the American culture, and was so for a long time. The other, by the way, was baseball. Many of the biggest political and racial storylines of the 20th century also played out in a boxing ring, whether it was German Max Schmeling and black American Joe Louis in the late 1930s or Muhammad Ali in the 1960s, with his brashness, anti-Vietnam War stance and conversion to Islam. Even non-political boxers stood for more than themselves in their corners. Billy Conn represented the entire city of Pittsburgh, not to mention every Irish-Catholic in America, every time he fought. Major championship fights were enormous events, way beyond the scale of Mayweather-McGregor, though obviously not in actual dollars. When the Associated Press ranked its top 100 athletes of the 20th century, five of the top 44 were boxers, including two of the top seven. Can you name the five? Then along came a lot of problems for boxing. First, every big fight used to be on television, with Howard Cosell as its voice. Then along came pay per view, which hurt the mass appeal for the sport, even as it made richer paydays possible. The main issue, at least to TigerBlog, is that for decades, everyone knew who the heavyweight champion of the world was. Patterson. Liston. Clay/Ali. Frazier. Foreman. Creed. Balboa. Lang. Balboa again. Everyone knew those names. Then along came an alphabet soup of boxing organizations, all with their own champions, with no sense of who actually was the one, true champ. That really hurt everything involved with boxing. Through in the supersonic rise of football on TV, and there you go. Boxing is now something that fewer and fewer people like, or are willing to invest in to watch. Boxing in the Olympics when TigerBlog was a kid was huge. It was also a springboard to instant name recognition for the best, like Sugar Ray Leonard, for instance. There were some unbelievable fights back then. TigerBlog watched Leon Spinks, another Olympic gold medalist, beat Ali, on regular TV, back in 1978. Maybe the last really classic fight was Hagler-Hearns, and that was more than 30 years ago. Even the fight the other night was gimmicky. Isn't McGregor an MMA guy? There's a lesson in there for other sports, by the way. Just because you're huge now, it doesn't mean you'll always be that way. TigerBlog was much more interested in the start of a new Princeton athletic year than the big fight. The women's soccer team kicked things off with a pair of unanimous decisions, knocking off Monmouth 3-0 Friday night and Villanova 2-0 yesterday. When TigerBlog watched the highlights on goprincetontigers.com from the two games, his first thought was that Princeton's new uniforms are pretty nice. Beyond that, a weekend sweep over two teams who had already played two games each prior to taking on the Tigers. In the earliest part of the season, it's not easy to be the team that hasn't played yet, let alone the team that has only practiced for less than two weeks. It's not easy to simply waltz into game shape. Abby Givens had three goals for Princeton this weekend after having only three a year ago, when she was honorable mention All-Ivy League as a freshman. Mimi Asom had her first of the year in the game against Villanova, and Natalie Larkin had the first of the year, in the win over Monmouth. That's another good sign. Five goals in two games, from three different players, with another emerging scoring leader. And, of course, no goals allowed. Next up is a relatively challenging weekend, as Princeton heads to the Givens' home state of North Carolina (she's a Charlotte native). The Tigers will be at North Carolina State and Wake Forest Friday and Sunday, and those two are already a combined 7-0-0. After that trip, Princeton is back for four games on Myslik Field at Roberts Stadium in 10 days, beginning Sept. 7 against Rider and then followed by New Hampshire (Sept. 10), West Virginia (Sept. 15) and Delaware (Sept. 17). After that, there will be six days until Yale comes to Princeton for the Ivy opener (Sept. 23). For the first weekend, things looked really good for Princeton. And it wasn't just the uniforms. So one person in Massachusetts won the Powerball, huh? TigerBlog knew he wasn't going to win. He didn't even buy a ticket. Instead, he asked a few of the people he knows who did buy tickets whether or not they would pay all of TigerBlog Jr.'s and Miss TigerBlog's remaining educational expenses. TB's Office of Athletic Communications colleague Warren Croxton flat out said no, he would not. TigerBlog figures that he's talking about a few hundred thousand dollars. What's that compared to $700 million? Brian Fitzwater, the IT guy here, was demanding his $20 back after Warren convinced him to go play. Fitz, of course, made a pretty good point. Why do so many more people play for $700 million than $40 million, or whatever it reverts to now that someone won? The odds are the same. The obvious question is "what would you do if you had $700 million?" Andrew Borders, another TB colleague, said he would not quit his job at all if he won all the money. He likes his job. Plus, he needs something to do. That's the big key. You could have all the money in the world, but what would you do all day? Eventually, you'd run out of stuff to buy and get tired of traveling. Then what? How long could you sit outside on your deck and look out at the ocean? TigerBlog said yesterday that if you get to this time of year and aren't excited, then you're working in the wrong place. Tonight is the first athletic event of the year, a women's soccer game between the Tigers and Monmouth, on Myslik Field at Roberts Stadium at 7. Admission is free, as it is to all regular-season soccer games for men and women. It's Game 1 of more than 600 for the academic year 2017-18, and that doesn't included other events that are more than just two opponents in one game, things like golf tournaments and Heps track and field and such. Andrew, for his part, is always among the most fired up for opening night. You will be too after you watch the video HERE. There's always a certain interesting feel to the first game of the year. It's almost like the game is trying to convince everyone there that hey, this really counts, summer is over, it's time to get back to work. It was another day, another team for head shots yesterday. This time, it was the field hockey team's turn. Princeton opens the season next weekend by hosting No. 1 North Carolina. As TB said the other day, head coach Carla Tagliente and assistants Dina Rizzo, Mike Pallister and Dave Williamson are being quite ambitious this year, as the eighth-ranked Tigers take on all seven teams currently ranked ahead of them. Such intensity is for the coming weeks. Yesterday it was about getting pictures taken, mostly by the incoming freshmen. They all seemed relaxed and happy, their own opening whistle a week away. They were all very polite, with a lot of "thank yous" as they left. TigerBlog will see plenty of Princeton Athletic events this coming year, like he does every year. One game he won't be at is the soccer game tonight. He has a good excuse. Tonight is the wedding of another of his OAC colleagues, Cody Chrusciel, one of the two video and multimedia studs here at Princeton Athletics. Cody will be marrying longtime girlfriend Justine Nothstein. Had TigerBlog played the Powerball and won, he would have given them enough money to cover the wedding and the honeymoon. On their response cards, Justine and Cody asked guests to write down a song that they promised to dance to were it played. TigerBlog put down "Hava Nagila." He doubts it will actually be played, which is good, because he's not a dancer anyway. Best of luck to Cody and Justine of course. TigerBlog wishes them nothing but the best. And good luck to the 1,000 or so athletes who will compete for Princeton this academic year. And it all starts tonight. Princeton women's soccer against Monmouth at 7. It'll be a nice night for a game. TigerBlog walked into Jadwin Gym yesterday morning and could see the football team out on Finney/Campbell Fields as he came by. By lunchtime yesterday, the freshmen for the men's soccer team had invaded his office for headshots. Actually, he never even had to get out of his car to know that things are coming back to life around here. All of Lot 21A, that's the small piece of the big Jadwin lot where athletic staff parks, was filled. The first game of the new academic year is tomorrow. Does that make today sort of like New Year's Eve? Princeton will host Monmouth in women's soccer tomorrow night at 7. The men's soccer team, women's volleyball team, field hockey team and men's water polo team all get started next weekend. Then it'll be cross country the following weekend. And football the one after that. Pretty soon it'll be basketball, hockey, lacrosse and summer. TigerBlog also heard the song "Runnin' With The Devil" on the radio yesterday. You know it? The song is from 1978, and it's the best song Van Halen ever did, which is saying something if you were into what is now called classic rock as it came of age. You know, like TigerBlog is. That song was the favorite song of a friend of TB's from Penn, a guy named Pat, who grew up in Longmeadow, Mass. TB has no idea whatever become of Pat. He hasn't heard from him in decades. He does remember that he was a really good guy. But he does remember how much he loved "Runnin' With The Devil." It's interesting the little things that stick with you all these decades later. Pat lived on TigerBlog's floor his freshman year at Penn. Back then, TigerBlog was thinking about law school. How'd that work out? TigerBlog Jr. leaves today for his junior year of college. He's double majoring in English and Politics, with an idea that he might want to go to law school. TigerBlog wrote about 1,400 words, very emotional words, about the day two years ago when he first took his son to college. You can read it HERE. This time, as TBJ leaves, it's more like "you can fit everything in your car, right?" and "text when you get there." It's not quite as emotional perhaps. It does take TigerBlog back to when he was a college junior. As he said, he, too, was thinking about law school, something that, as you might have guessed, never materialized. Instead, it was at the start of his junior year of college that he got sidetracked, away from law school. Perhaps if MotherBlog had been more like Mrs. Miller in "Almost Famous," that might not have happened. Anyway, it was back when TB was a college junior that he first got a part time job covering high school football at "The Trenton Times." He figured it would be a fun way to earn a little money and then got on with life. Now, it's four decades later, and, well, he's still basically doing the same thing. TigerBlog has told you this story before, but on his first day in the newspaper business, he was warned by Jack McCaffrey, then in Trenton and now for a long time with the Delaware County Times, that one story and TB would have "the ink in his blood." He was sort of right about that. Jack's brother, by the way, is Fran McCaffrey, the head men's basketball coach at the University of Iowa. A long time ago, Fran played at Penn and worked with TB in the basement of the psychology department, which is where they became friends, and how TB first met Jack, and how Jack came to get TB a job in Trenton. Who knows where TB would be right now had he not met Fran, and then Jack. He hasn't spoken to Jack or Fran in a long, long time, but the major directions in his life all started with those two guys. Life can be random, no? Anyway the point is that TigerBlog has gone on this carousel his entire professional life. and for the last nearly 30 years, the carousel that is Princeton Athletics. The end of August is always when the momentum for a new academic year begins. Then there's the overlap of fall and winter. Then the winter, which is pretty slow in December and especially January, with first semester exams. Then it gets going in a big way again. Then it's the busiest time of all, the winter/spring overlap. Then there's the rest of the spring. The banquet. Reunions. Graduation. And then another summer. Like he said, repeat, repeat repeat. If you get to this time on the calendar and you're not exciting about the start of the new year, then you shouldn't be working here. TigerBlog figured there'd be a day this summer when he desperately needed a topic and that's when he'd tell you about the thing that's really been messing with his head lately. The paper towel dispenser in the D level bathroom in Jadwin Gym. And yet he never got the chance. Something else always came up to discuss, and the paper towels had to wait their turn. Now, as the athletic year for 2017-18 is two days away, the Princeton Athletics summer is basically over. TigerBlog has something he wants to talk about today anyway, but hey, might as well get that whole paper towel thing out there first. So there's a paper towel dispenser in a lot of bathrooms. You pull the towel down and tear it where it's perforated. You've done this a million times. What's the common denominator? Each paper towel is the exact same size. In D level, the paper towels come out at different sizes. Some are huge. Some are small. It's like the random paper towel machine. The part that's confusing is that they're all perforated. Aren't they perforated in advance? Or do they go through a piece of the dispenser that perforates them there? And if they do, why wouldn't they all be the same size anyway? It's been a very confusing summer for TB. The paper towels, you know. They're messing with TB. They're probably laughing at him every time he goes in there. Hey, let's make one towel huge and the next one tiny. That'll show the humans. Anyway, that's the paper towels. With the start of a new athletic year, what else would TB want to share but paper towels and Princeton men's basketball? There was a video posted yesterday that counts down the top 10 plays for the Tigers from the 2016-17 season. Want to see it? Click HERE. The video isn't really about which play was No. 4 versus No. 7 or so. It's more about another look back at the extraordinary season that was 2016-17 for Princeton. The Tigers went 16-0 in the league a year ago, something no other team had ever been asked to do, what with the Ivy tournament. The video recounts just how close Princeton came to not making it past the semifinal at fourth-place Penn, but then you can see all the major steps to the final and then the NCAA tournament. Yes, but now it's time for 2017-18. There was a story on goprincetontigers.com posted Monday that previewed the first game of the year, the women's soccer game at home Friday night between Princeton and Monmouth. In a blink, it appears, another summer has zoomed past. Monmouth leads the all-time series with Princeton 9-4, but most of those games were played long ago. The teams have only played twice in the last 15 years, and Monmouth has never played on Myslik Field at Roberts Stadium. The Tigers feature junior Mimi Asom, who already ranks 13th all-time in goals scored at Princeton with 21. Only five Princeton players have ever reached 30 for a career, so it won't take that many more for Asom to reach some really rare company. Princeton is also at Villanova Sunday. Playing games again. Wow. It's hard to believe. There was another story on the website yesterday about the field hockey team, about how the Tigers are ranked eighth in the preseason. Princeton went to the NCAA Final Four a year ago in the first year with head coach Carla Tagliente and assistant coach Dina Rizzo. Want to talk about tough scheduling? Princeton is ranked eighth in the preseason. How many teams ranked ahead of Princeton do the Tigers play this season? How about all seven. And it begins with No. 1 North Carolina, coming up on Sept. 1 (which is a week from Friday) on Bedford Field. Wait, a week from Friday is September already? For the record the other top seven teams Princeton will play are: No. 2 Duke (Sept. 17), No. 3 - the defending NCAA champ - Delaware (Sept. 3), No. 4 UConn (Oct. 8), No. 5 Syracuse (Oct. 1), No. 6 Maryland (Sept. 19) and No. 7 Penn State (Sept. 10). The Penn State and UConn games are at home. The Delaware game is in Newark on Sept. 3, which means that Princeton opens its season with the two teams who played in the NCAA final a year ago. Ambitious. But it's also good to challenge a team with high expectations that way. It's part of what has always made Princeton field hockey so special. Anyway, if you have summer plans that you haven't gotten to yet, you better get on them. You're running out of time. If you were in Princeton yesterday afternoon, then you had one of the perfect spots in the country for the eclipse. Princeton, the one in New Jersey, had only a 71 percent eclipse, with the peak of it at 2:44 in the afternoon. TigerBlog read beforehand that it wouldn't be completely dark out but would instead mirror the conditions of early evening. TB would be more impressed, of course, if there wasn't one of those "early evenings" every night. Now if it would simulate the conditions at noon at 2:44 a.m., now that would be pretty cool. The fact that the eclipse is something that happens very rarely is somewhat intriguing. The actual eclipse didn't really do much for TB. Maybe it comes from being in the basement of Jadwin all day. Or maybe it takes more than just some rare celestial event to get him fired up. TigerBlog remembers the last one, back in 1978. He was in high school. The thing he remembers most is being told not to look directly at the sun or he'd summer permanent eye damage. Then, yesterday, there were stories online about people who had in fact suffered eye damage in the last eclipse, or the one in 1962. The next one will be in 2024. TigerBlog assumes he'll be just as unimpressed. He hopes you enjoyed it though. And that your eyes are fine. Oh, and it turns out that there are 11 states in this country that have a town called "Princeton." Anyway, only slightly less rare than an eclipse is a Barron family sighting in Jadwin Gym these days. Interestingly, that happened yesterday too. Richard and Maureen Barron and their three kids Lane and Rae (twins entering eighth grade) and Billy (heading into fifth) made a stop here yesterday on their way from Maine to South Carolina. Who are Richard and Maureen Barron? They are, TB believes, the only husband and wife coaching tandem in Princeton history who have both won Ivy League championships. Is that right? Is he forgetting anyone? Richard Barron was the women's basketball coach at Princeton before Courtney Banghart. He coached the Tigers for six seasons, including an Ivy title in 2006. He's also a Jadwin Gym lunchtime basketball legend. RB: "Can you believe she did that?" TB: "Can you believe that you criticized someone's decision making after you threw a behind-the-back pass off one of the green screens on a 3-on-1 fast break today?" Ah, Richard. He's a good man. A likeable one. Now the head coach at Maine, he's battled through a really tough road health-wise, with a rare condition that affected his hearing, balance and other things. "I literally had a hole in my head," he told TigerBlog yesterday. That hole was between his ear and his brain, and it caused every sound to become amplified. It took surgery at UCLA to correct it and start Richard back down the road to being healthy and being able to resume coaching, something he couldn't do this past season. He looked good as he sat in TB's office yesterday. Relaxed. As for Maureen, she was the softball coach for those same six seasons, during which time she won four Ivy titles. Does that make her four times the coach of her husband? Before she became the coach here, she was a player (as Maureen Davies) on three Ivy championship teams here. She also was a four-time All-Ivy League selection, and she also won the Ivy Rookie of the Year and Ivy Pitcher of the Year awards during her career. Among the school records she holds are most wins in a career (83, or 26 more than the next-best total) and shutouts in a career (32, or five more than second place). She's also third all time with 596 strikeouts. Remind TigerBlog to research how many people have ever been part of three Ivy League championship teams here as a player and then won at least four as a head coach. He can think of one off the top of his head - the late, great Bob Callahan with the men's squash team. Maureen, like Richard, doesn't appear to have changed much. She's still the same easy-going, funny, laid-back Mo. They're happy in Maine, they said. The winters are, you know, Maine winters, but so what. They're used to them. It's been 10 years since they worked here. TigerBlog isn't sure the last time he saw them. Their kids are certainly growing up. They wanted to see pictures of TigerBlog Jr. and Miss TigerBlog. They asked about all the people they knew who used to work here, asking which ones TB was still in touch with these days. They're just really nice people. Richard and Mo. It was really good to see them. Oh, and the eclipse? It was actually really cool. Seriously. It looked like it was clouding up, but it wasn't. It felt like it was cooling off, but it wasn't. And then it got a little dark, like it was early evening. And then it got light again. By 4 or so in the afternoon, the world was back on track. And the pictures that TB saw on TV from the total eclipse were even more amazing. Total darkness, in the middle of the afternoon. He can't wait to share his thoughts on the next one with you in seven years. If you are like TigerBlog, then you too were much more excited for Saturday night's Major League Lacrosse championship game than you will be for the next Super Bowl. Also, in another 50 years, the MLL championship game will be bigger than the World Series and Super Bowl combined. Come find TB then and tell him he's wrong if it doesn't quite work out that way. 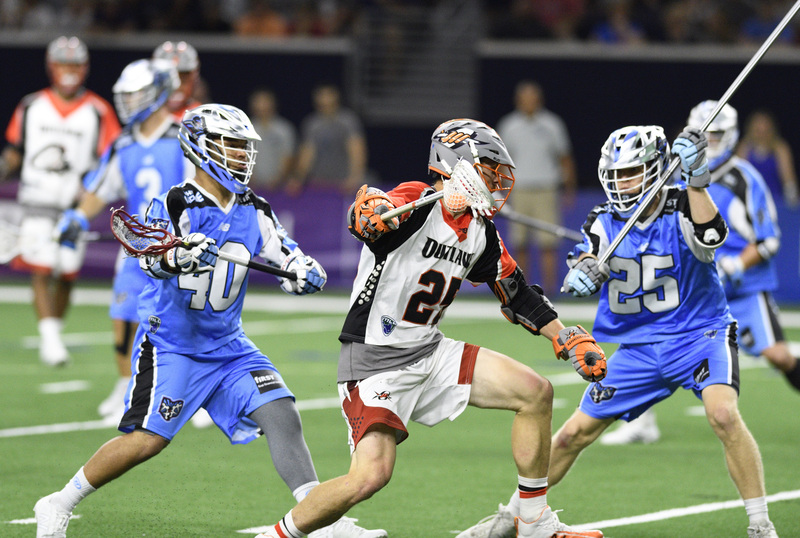 The game this past Saturday night featured the Ohio Machine and the Denver Outlaws, a rematch of last year's title game. If TigerBlog is correct, then only once in NFL history has there been a Super Bowl rematch, with the same two teams two straight years. Can you name it? The MLL game Saturday night was a tough one for TigerBlog, since it matched Princeton alum Tom Schreiber (Ohio) against Princeton alum Zach Currier (Denver). 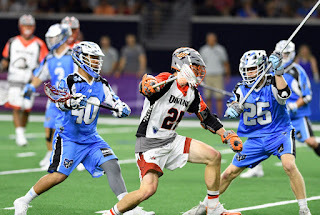 Ryan Ambler and Gavin McBride, two other Princeton alums, are on the Denver roster and have contributed in big moments for the Outlaws this season but were not on the active roster for the championship game. TigerBlog never did figure out which team he was rooting for in the game. He actually wasn't rooting for either. He was just rooting for Schreiber and Currier. Schreiber had a goal and three assists, as the Machine scored the final seven goals of the game to win 17-12. Denver had led 10-6 in the third quarter. Schreiber is on quite a run in the sport. He won his second straight Major League Lacrosse Most Valuable Player Award Friday night, before the championship game. In between, he was the Rookie of the Year in the National Lacrosse League with the Toronto Rock, despite having next to no experience playing indoor box lacrosse before. "Reign as the greatest player in the world continues." That's pretty good. Schreiber is completely ambidextrous as a lacrosse player. He's equally adept as a shooter, dodger and feeder, with either hand. He makes everyone around him better. His vision is extraordinary. And he's a middie. At Princeton he was a three-time first-team All-America. He's the only middie in program history with at least 200 points, which he accomplished with 106 goals and 94 assists. And now he has a professional championship. As great as Schreiber is, there is no other player anywhere he plays quite like Currier does. You saw it all spring at Princeton, when Currier did things that no other player in program history ever dreamed of doing - 24 goals, 34 assists, 130 ground balls, team-leader in caused turnovers, 56 percent face-off winning percentage. And yes, it still bothers TigerBlog that Currier was not first-team All-America. That was a joke back in May when it happened, and it's an even bigger joke now that you've seen how Currier has impacted the Outlaws and Major League Lacrosse. Actually, scratch that. It's was such a big joke when it happened that it's hard for it to be any bigger now. Of all of the snubs that TigerBlog has ever seen, that one is the worst. Currier might not be the best player in the world right now. What he might be, probably is, is the player who can do the most different things well. Currier had a monster game Saturday night. He finished with a goal - off a ground ball win off a face-off - and added three assists, including a ridiculous 20-yard pass to Michael Bocklett on the far pipe for a goal to put the Outlaws ahead as time expired in the first half. It's what he did beyond that that separates him from other players. He had three caused turnovers, including two that came after Denver lost face-offs but before Ohio could get settled offensively. In addition, he also drew at least three penalties from Ohio - one after his goal for a late hit, one in the middle of the field for unnecessary roughness and one on a slash when he was carrying the ball. That's how he is. He is the most relentless player TigerBlog has ever seen, and it eventually just messes with the other team. He also goes non-stop. He bounced right back from every hit, including some massive ones. Had Denver held on to its lead, he would have had a real case for game MVP honors. And so it was Schreiber against Currier. Not an easy one for a Princeton fan, or very easy, since both are exceptional to watch. The rematch may come in Israel next year at the World Championships, with Schreiber the American and Currier the Canadian,. Though neither team's roster is yet set, TB has a sense they both have a great chance to be there. That will be fun also. Oh, and the trivia question? The only Super Bowl rematch was the Cowboys and Bills, in the early 1990s. Oh, and enjoy the eclipse. Party At The Surace's, But When? TigerBlog Jr.'s best buddies from when he was little are named Matthew and Jared. Spoiler alert - they're not little anymore. Matthew has a little brother named William, who also isn't little anymore. Where does the time go? Today's question - who is the guy with whom he was playing catch? While you're pondering that, TigerBlog will point out yet another example of how he is literally ahead of his time. Last night was Bob Surace's annual preseason barbecue at his house. Beyond the fact that it's a fun night with a lot of food at a time just before things really get going around here, it's really a testament to Surace. TigerBlog isn't sure how many college football head coaches are as easy-going and genuine as Surace is. TB is 100 percent sure his attitude is "hey, I'd really like to do something nice and have a big picnic here before practice starts for a bunch of people I care about" and not "hey, if i have a picnic, then it'll make me look like I care about a bunch of people that I really don't care about but need to do things for me." Oh, you know who doesn't come across as really genuine and likeable as a football coach? The guy from "Last Chance U," especially in Season 2, which TB just finished. What was TigerBlog talking about? Oh yeah, being ahead of his time. TigerBlog thought the Surace picnic was Tuesday. In fact, it was about 5:15 Tuesday afternoon when he left his office to head to the party. He stopped in Room 1 before he left, where he saw Ford Family Director of Athletics Mollie Marcoux Samaan and Executive Associate Director of Athletics Anthony Archbald and asked if they were going to the party. That's when they pointed out that yes, they were going, but no, they weren't going until Thursday. Which was yesterday. TigerBlog then texted Surace to let him know that he'd almost come by on the wrong day, and Surace responded that it would have been no problem and that they would have fed TB even on Tuesday. And, when TB arrived last night, Surace's wife Lisa said that yes, she would have made him dinner had he showed up Tuesday. And TB is pretty sure she meant it. That's just how they are. Opening kickoff for Princeton football is four weeks from tomorrow, when San Diego will be on Powers Field at Princeton Stadium for a noon kickoff. The first athletic event of the academic year is one week from today. You should have listened to TigerBlog about what he said about August when it started. It flies by. Ah, but the summer isn't over yet. There's still one more major event to go. The Major League Lacrosse championship game is tomorrow night in Frisco, Texas. If you want to watch, it's on CBS Sports Network at 7 Eastern. The game is a rematch of last year, as the Ohio Machine take on the Denver Outlaws. Denver rallied last year to win 19-18. Princeton has four alums involved in the game. Ohio features Tom Schreiber, who led Major League Lacrosse in assists this past year with 26, playing in just 10 of the 14 regular season games. He missed the first four because he was playing with the Toronto Rock in the National Lacrosse League, in which he was the Rookie of the Year. This came after being the MVP of Major League Lacrosse last year, and he is now one of three finalists for the MVP award again this year. There are some great players out there. It'll take a lot for you to convince TigerBlog that Schreiber, had three goals and three assists as the Machine beat Florida 18-13 in the semifinals last week, isn't the best player in the world right now. Denver a year ago did not have any Princetonians on the team. This year there are three. Zach Currier, a finalist for MLL Rookie of the Year, has had a huge impact on the league in his first season, or the nine games of it he was able to play after the MLL draft. Currier is joined by former Princeton teammates Ryan Ambler and Gavin McBride on the Outlaws. So this is a tough one. Which team should TigerBlog be rooting for in this one? Well, at the very least, Princeton will have someone on the winning side. Oh, and back to the picture of William? The stranger on the beach? Hints - he's a former National Football League MVP and a two-time AFC Offensive Player of the Year, as well as a starter in a Super Bowl game. Rich Gannon. He just happened to wander by William, and there they were, playing catch. He said that Gannon was a really good guy and that he's pretty good at throwing a football. The summer athletic travels of those representing Princeton may finally have ended. TigerBlog isn't sure of any remaining international competitions for the summer of 2017 for Princeton and its coaches and alums. It's been quite a successful few months, with medals earned in major international competitions in places like Israel, Bulgaria, Italy, England and New Zealand. Is TB missing other places? To that list, you can add some other exotic locations. Like Tokyo. And Lancaster. You know. Lancaster. The one in Pennsylvania. Kat Sharkey made the long trip all the way to a few exits out on the Pennsylvania Turnpike to Lancaster, to a rather fascinating little venue called Spooky Nook. Though it sounds like the name of a town in a Washington Irving story and from the inside reminds you of a really big airport terminal, Spooky Nook is an athletic venue and one of the hubs for indoor and outdoor field hockey in this country. It was also the site for the Pan American Cup field hockey tournament last week. Sharkey, a 2013 Princeton alum, would be the tournament's leading scorer as the U.S. won bronze, defeating Canada in the third-place game. For all of the great players Princeton field hockey has had through the years, none of them has ever scored more than Sharkey. In fact, Sharkey is the program's all-time leader in points (245) and goals (107), has the two highest individual point totals for a season (85 in 2012, 74 in 2010) and the single-game records with six goals and 12 points (at Richmond, Sept. 10, 2010). That's a lot of goals. Sharkey already has experience at the highest levels of international field hockey, having played in the 2016 Olympics for the United States. The Americans had a great start to that tournament and got into the medal round, only to fall short against Great Britain in the quarterfinals. Sharkey was one of three Princeton alums in Rio a year ago, along with the Reinprecht sisters, both of whom have retired after playing in the last two Olympic Games. Sharkey also teamed with the in 2012, when Princeton won the NCAA championship. The 2017 U24 Four Nations Tournament provided meaningful competition and development opportunities. The USA's participation in the tournament was intended to help further develop the USA Basketball athlete pipeline and to help prepare athletes for possible future participation in the USA Basketball Women's National Team pool. The United States team featured top college players from around the country. Not surprisingly, the Americans swept the other three teams there - Australia, Japan and Canada. The event for the U.S. was about, as it said, player development and international exposure. And, for that matter, coaching development. Banghart was an assistant for the U.S. team. The head coach was Louiville's Jeff Walz. The fact that Princeton's coach was chosen for her spot with USA Basketball shows just how much national respect Banghart has piled up in her first 10 years with the Tigers. The record that she and top assistant Milena Flores, the only one who has been with her for all 10 years here, has put together is astonishing. Princeton, before Banghart became head coach, had been to zero NCAA tournaments and one WNIT. In her first two years, as she began to build her program, she went 7-23 and 14-14. Since then, it's been eight years, eight postseasons, with six NCAA tournaments, an NCAA tournament win (the first in program history) and an NCAA at-large bid (the only one in Ivy basketball history). Her record for the last eight years is 187-50. In the league during that time? It's 100-12. That's insane. A hundred wins against 12 losses. That's basically winning your league games nine out of 10 times. Success that like gets noticed, and it's helped Banghart get involved in coaching on the national team level. The experience that she had this summer can't help but give her even greater perspective as she comes back to Princeton, where her team will be lead by sophomore Bella Alarie, who won a silver medal with the U.S. team at the World U19 Championships in Italy. It's been that kind of summer for Princeton's athletes and coaches. Compete. And see the world. Even the part of it that's called Pennsylvania. Bill Bradley scored 2,503 points as a Princeton men's basketball player, in three years, without a three-point shot. How does TigerBlog know that? Because that's what the record book says. It's been that way since TigerBlog first started to cover Princeton sports. Bill Bradley - 2,503. TigerBlog has never bothered to confirm that. How would he, for that matter? He's seen a game-by-game listing of Bradley's point totals for his career, one that, by the way, showed TB the single most fascinating stat about Bradley's unreal career here. It's not the points. It's not the fact that has the 11 best single-game performances in program history. It's not that it's more than 50 years later (30 of them with the three-point shot) and nobody is within 858 points of him and only three players - Ian Hummer, Douglas Davis and Kit Mueller - are within 1,000 of him. Nope. It's that in his three varsity seasons at Princeton, Bill Bradley never failed to score fewer than 16 points in a game. Or at least that's what the game-by-game says. Now, let's keep in mind that that game-by-game list was hand-written. What if, as it was being chronicled, there was a "26" written in instead of a "25" or "27.?" Who would ever know? TigerBlog would have to go back and find every box score from every game Bradley played here and cross check against that hand-written game-by-game list. Then again, maybe the hand-kept box scores back then were wrong. Or the computerized ones now? Maybe someone was given a basket that Bradley scored, or the opposite. Well, it's that there's a certain leap of faith involved in some things. Like historical records. Bradley has 2,503 career points because a list in the record book says he does. That's all. Now, what do you do if you have two lists that contradict each other and no idea where either list originated. That's the case for TigerBlog when it came to answering a simple question: How many Ivy League championships has Princeton won. TigerBlog can answer that fairly accurately in one way. It is true that Princeton has won more, a lot more, than any other school. On the other hand, he's not sure yet what the absolute exact number is. He can say it's around 470. Is that good enough? Well, no, it isn't. So where's the problem coming from? TigerBlog has two spreadsheets that list all-time Ivy League championships, one for Princeton, and one for all eight league schools. The problem is that they differ slightly. The other problem is that TigerBlog has no idea where the original spreadsheet originated. He just knows that it's been on his desktop for years, decades. Did he put it together a long time ago when he started? That's as possible as anything else, including that he found the file and has just kept adding to it each year. Anyway, when he compared the two (he has no idea where the other one came from), he found that they differ by one here, one there. His spreadsheet says Princeton has 463 Ivy titles. The other one says 472. TigerBlog's colleague Warren Croxton started on the website and then tried to go through each year individually, to crosscheck titles listed on the two different sheets. The Ivy League website is helpful, in that it lists year-by-year champions, but there are inconsistencies there too (not throwing the Ivy office folks under the bus; this all started because of Princeton's inconsistencies). The only way to do this accurately is to go back to the beginning, which would be 1956-57, and create a new spreadsheet, one that lists each year and then has each team that won the championship that year in a column. Then TB will add up all the columns. He's thinking it'll be closer to the 472 number than the 463 number, but he'll be honest about what he finds. He can give you some numbers of which he's positive. Princeton has won 222 Ivy titles in the last 20 years, an average of exactly 11.0 per year. Only one other school (starts with an H) has ever reached double figures in an academic year. Princeton has averaged 11 for the last 20 years. Also, Princeton's 222 in the last 20 years is 65 more than second-place Harvard. Cornell is third, with 100 exactly. TigerBlog is positive of those numbers. Well, pretty positive. As for 2,503, he'll go with that without questioning it. And 1492 and 1776 too. Imagine waking up one day in a place that you've been for the last 36 years and finding out that your address and zip code are now different. That's what happened to FatherBlog. For the last 36 years, his address has been 570 Seventh Ave. Then, about a year ago, he got a notice that said the new address would be something on 200 West 41st Street, and with a different zip code and everything. This was despite the fact that his office never changed. It was still on the sixth floor of the same exact building. FatherBlog was on Fifth Avenue before he moved to Seventh. The address back then was 521 Fifth Ave. Don't ask why TB remembers that. Anyway, FB was on Fifth Avenue for 17 years, meaning he's spent 53 years between the two locations. That's sort of a long time. TB's memories of 521 Fifth are of a huge lobby, with a bunch of stores in it. There's just a newsstand in the lobby of 570 Seventh, er, 200 West 41st. TigerBlog's other memory of 521 Fifth was of walking from the Port Authority bus terminal across to Fifth Avenue. The other office, whatever the address, is much closer to the bus terminal and even closer to a parking garage, where TB would park when he went into the city. Parking in New York, by the way, is expensive. As it turns out, FatherBlog doesn't want to stay in his office, regardless of the address. And 53 years apparently aren't enough time spent working in New York City every day, so he decided to try yet another address. This one will be on West 36th Street, which is good, because it puts him in good proximity to his two favorite lunch places, an Italian restaurant and a kosher deli. So like TB said, that's 53 years worth of working in New York. That's 53 years worth of fighting traffic at the Lincoln Tunnel every morning. TB couldn't do that. He's annoyed when he misses the light on Route 1 and Washington Road. TigerBlog had the same office for 21 years here in Jadwin. That's the one that was on the balcony. He's coming up on two years down in the basement of Jadwin, next to the wrestling room. As they say in the wrestling room, in Jadwin "moving down is moving up." The Jadwin lobby project is continuing, and it's getting into serious construction mode. There's a large tarp that stretches the length of the mezzanine now to keep the dust, and presumably some of the sound, out of the offices upstairs. TigerBlog was talking to Brendan Van Ackeren of the Princeton Varsity Club yesterday afternoon, and Brendan said he had to close his office door because of the jackhammer. If the name Van Ackeren is familiar to you as a Princeton fan, it's probably because Brendan is married to Lisa Van Ackeren, the coach of the two-time defending Ivy League champion softball team. The two are expecting their first child next month, though Lisa hardly looks that far along. There was plenty of noise in TigerBlog's office yesterday afternoon as well. The women's soccer team was down here for preseason headshots. The arrival of the first team to get its pictures taken is one of the sure signs that summer is winding down. The women's soccer team starts practicing today in advance of opening day of the 2017-18 Princeton athletic year, which comes up a week from Friday - egads - when the Tigers host Monmouth. Has the summer really zoomed by so quickly? TigerBlog saw field hockey head coach Carla Tagliente and assistant coach Dina Rizzo as they walked out of the building yesterday morning. They'll start practicing Thursday. A year ago, in their first season with the Tigers, the two led the team to the NCAA Final Four. They'll all be back at it soon. Men's soccer. Water polo. Women's volleyball. Football. Cross country. At the end of the year, TigerBlog will be able to tell you how many games Princeton teams have played. That's easy. It'll be between 600 and 700, like every other year. The question of how many practices is a little more difficult. Most teams have four or five practices for each game. Others have fewer. If you take an average of four, say, then that's around 2,500 or so practices for the academic year. That's when the teaching is done. That's when the competition for playing time occurs. That's when so much of the experience that is playing a sport in college occurs, with everything that goes along with it. The first one of those for this year is today. The World Championships of Track and Field in London didn't end the way TigerBlog would have hoped for his two favorite athletes. Usain Bolt and Robby Andrews, that is. Both the nine-time Olympic gold medalist and the Princeton assistant coach came up injured in their last races in London this past week. TigerBlog isn't 100 percent sure what happened to Bolt. He just saw pictures of the Jamaican unable to finish the relay. If that's the way his career ends, so be it. He's still the greatest sprinter ever, and one of the most entertaining athletes TB has seen in any sport. As for Andrews, he was running in the semifinals of the 1,500 when he pulled his calf. Had he kept going, he said, it would have torn completely. TigerBlog very much hopes that this is just a small bump in the road for Andrews, who will be 29 in 2020, when hopefully he'll run again in the Olympics. While on the subject of track and field, there was the story last week about how Princeton men's head coach Fred Samara will be inducted into the U.S. Track & Field and Cross Country Coaches Association Hall of Fame as part of the Class of 2017. The ceremony will be in December in Phoenix. Did you have the same reaction TigerBlog did, because this is what his original thought was: Wait, Fred Samara wasn't already in the U.S. track and field coaches hall of fame? Samara has coached Princeton to 41 Ivy League Heptagonal championships. He's coached 200 outdoor Heps champions and 229 indoor Heps champs, not to mention NCAA champions and Olympians. He has coached Princeton to seven - seven - Heps "Triple Crowns," winning the cross country, indoor track and field and outdoor track and field championships in the same year. You know who besides Fred has done it even once? A former Olympic decathlete himself, Samara has run a program that has won big on the track, while also producing an army of loyal, dedicated, successful alums. He does all this with humility and class, with a philosophy of recruiting the right kinds of young men and then working hard to achieve the high goals that he sets. Actually, the same is true of another Princeton coaching icon, Chris Sailer, the women's lacrosse coach. Also like Fred, Chris Sailer has recently learned of a major career honor. Chris is already a U.S. Lacrosse Hall of Fame member, the result of a career that has seen her lead Princeton to three NCAA championships, 11 Final Fours, 24 NCAA tournaments and 13 Ivy League championships. She has guided the team to three NCAA championships, 11 national semifinal appearances, 23 NCAA tournament appearances and 12 Ivy League titles. The U.S. Lacrosse national headquarters is located outside of Baltimore. It is already the home of William G. Tierney Field, named for Bill Tierney, the men's coach at Princeton for 22 of the 32 years that Sailer has been the women's coach. Late last week, U.S. Lacrosse announced that the walking path at the national headquarters will be named Chris Sailer Trail. The dedication ceremony will be held Oct. 21, when Princeton plays on Tierney Field as part of a four-team fall event. "In addition to leading her teams to great success on the field, Chris Sailer has been a tremendous advocate and representative of the sport during her career," said Steve Stenersen, CEO of US Lacrosse. "We're delighted and proud to recognize her at our facility." The Intercollegiate Women's Lacrosse Coaches Association will also be honoring 11 former women's lacrosse coaches "to celebrate as trailblazers of the game for their exceptional work advancing women's lacrosse and the coaching profession during the Title IX era." When TigerBlog first met Chris Sailer, she was the head women's lacrosse coach and the assistant field hockey coach. Games were played on Gulick Field, if TB remembers correctly, a grass field with almost no stands there. It was elevated above Lourie-Love Field, the old soccer facility. Sailer has been exactly what U.S. Lacrosse says - a tremendous advocate and representative of her sport. And she has the same for Princeton Athletics as well. In a year of great moments in Princeton Athletics, you could make a very strong case that the best was the women's lacrosse NCAA tournament game against Cornell on Sherrerd Field. Princeton pulled out the game at the end, shortly after the skies opened up for a massive rainstorm. It made for a great on-field contest. The other part that was great about it was the turnout of Princeton students, way more male than female, cheering wildly through the rain. That only added to the moment, and was a testament to Chris Sailer for the way she has built her program and helped to build her sport. Any list of the greatest coaches in Princeton history has to include Fred Samara and Chris Sailer. Oh, and if you think they're slowing down at all, or losing any of their intensity? Princeton won 11 Ivy titles the last academic year. Fred Samara and Chris Sailer brought home three of them. TigerBlog was out on the bike the other morning when he got stung by a bee. He never saw the culprit. He just knows that he had his right hand on his handlebar and then all of the sudden - wham, someone else showed up. It had been awhile since TigerBlog had been stung by a bee. He didn't like it anymore this time than he did back then. Still, being the tough guy that he is, TB persevered, making it two more times around the loop in Skillman Park, finishing as planned. TB has no idea what happened to the bee. Do bees really die after they sting someone? Is that a myth? If it's true, then that was an awfully big commitment on the part of the bee. For one thing, TB didn't do a thing to him. Why the violence? For another, it was such a nice morning. Is it really Aug. 11 already? Yikes does this month zoom by. The coming forecast suggests that the next week will not see temperatures higher than 81 in Princeton, which is extraordinary for this time of year. And what time of year is it? Well, it's time for things to start rolling around here again. The first practices of the year for fall teams will be beginning. The first game is two weeks from today, a women's soccer game at home against Monmouth. Remember how TigerBlog has been saying that he'll feel really old the day that the son or daughter of an athlete he covered at Princeton shows up on a Princeton roster. It hasn't happened yet - but it's coming really close this fall. Julia Simkus will be a freshman on the women's soccer team. She is the daughter of Rich Simkus, the former Princeton men's basketball player. Oh, and Abby Simkus, a Penn grad. It's not the same as when it'll be the child of someone who was competing here when TB covered Princeton for the newspaper or was already working here, but hey, Simkus' daughter? When TigerBlog first started doing radio for Princeton, it was for men's basketball, way back when. The play-by-play man was David Brody, and he and TigerBlog would do the road games together. The first game TB did was at Michigan State in the 1989 Oldsmobile Spartan Classic, where Princeton defeated Arkansas-Little Rock and then lost to the host team in the final. By the way, before Princeton played Michigan State, then-assistant coach Bill Carmody said that if Princeton was outrebounded by 15 or fewer, it would win the game. Princeton was outrebounded by 16 - and lost by two, 51-49. Why does TB remember that? Also by the way, the Princeton-UALR game was the first TigerBlog would broadcast for the Tigers. It was the 1989-90 season. Who was the starting five? TB will give you a few paragraphs to figure it out. So anyway, Julia Simkus will be on the women's soccer team. Even though the 2017-18 academic year is right around the corner, it's not quite the end of the summer for Princeton alums, or one assistant coach. Robby Andrews, assistant coach for men's cross country, competed in the first round of the 1,500 at the World Championships in London yesterday afternoon. And the Major League Lacrosse playoffs begin this weekend, with Princeton well-represented. 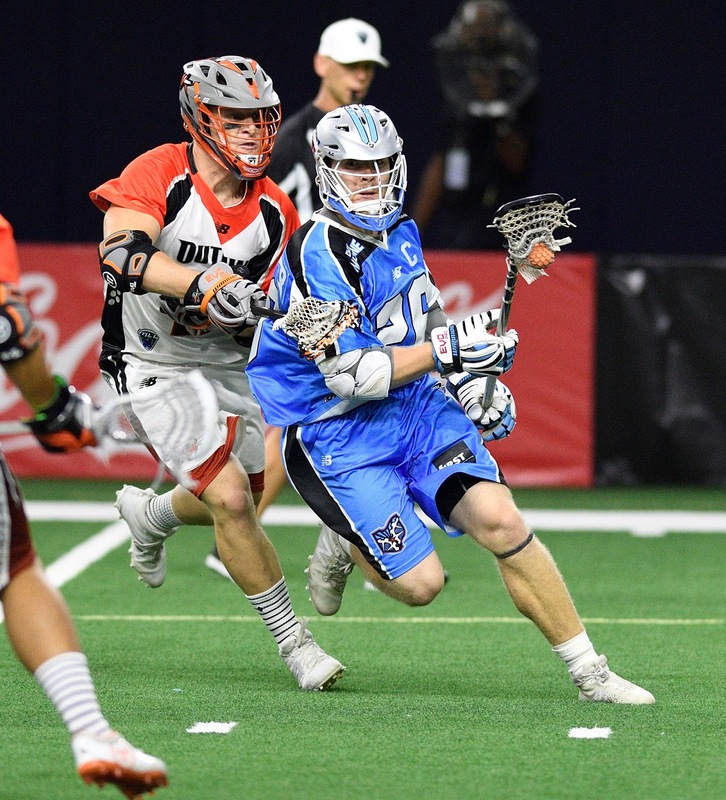 Tom Schreiber, the MLL leader in assists for the regular season, is with the Ohio Machine, who will host the Florida Launch in one semifinal tomorrow. The other semifinal has Kip Orban and the Rochester Rattlers at Denver to face an Outlaws team that has Zach Currier, Ryan Ambler and Gavin McBride. Currier finished his first MLL regular season 13th in the league in assists and tops among rookies, despite being a middie. The Major League Lacrosse championship game will be held a week from tomorrow in Frisco, Texas. TigerBlog was trying to remember which Princeton alums have won MLL championships in their careers. Kevin Lowe definitely did. He remains the only player ever to score an overtime goal in an NCAA championship game and an MLL championship game. Matt Striebel and Ryan Boyle won more than one MLL title. Trevor Tierney won one. TB is pretty sure Tyler Fiorito was the backup goalie for Chesapeake when it won in 2012 and 2013. Is that everyone? If he's missing someone, TB apologizes. Oh, and the trivia answer: Matt Henshon. Matt Eastwick. Kit Mueller. George Leftwich. Sean Jackson. The Double-B turns three this week. That's Blake Borders, by the way. He's the son of Andrew and Amy Borders. Andrew is TigerBlog's colleague here in the Office of Athletic Communications. Blake is into cars, er, "vehicles," as he calls them. He has a big bag of them, the matchbox kind, and the bigger imagination that three year olds have to bring them to life. When Blake is here with his dad, there will be a trail of cars, as well as improvised roads, ramps and everything else. By the way, as he turns three, Blake can claim something that you probably can't. He's been to all 50 states. TigerBlog hasn't been. He's at 37. Hanging out with Blake and his cars is tiring. It's been awhile since TigerBlog has had a three year old, and he forgot just how much energy they have. Of course, maybe TB had more energy himself that long ago. It actually got him thinking something weird. He could be closer to the time that he has a three-year-old grandchild than when he had a three-year-old child. As TigerBlog walked into his office, just before he got to play with Blake, he saw Jared Petty in the hallway. Jared has a summer internship at Princeton with the engineering department, and he was here with a group of engineers on some project in Jadwin. Jared will be a junior at York College in Pennsylvania. He's one of TigerBlog Jr's. best buddies and has been since not they were not that much older than Blake Borders is now. They've been to a million events on this campus through the years. TBJ and Miss TigerBlog will take with them for the rest of their lives the memories they have from their childhood times at Princeton. It's been a really special part of working here for as long as TigerBlog has, seeing his children come to games, go to summer camps, stay overnight in the dorms, walk up to Nassau Street. Each September, Princeton Athletics takes a "team picture" of the entire departmental staff together. What would be really interesting would be to take a picture of the children of all of the people who work here. TigerBlog isn't really sure how many kids would be in such a picture. It would be a lot. The OAC is on E level of Jadwin, next to the wrestling office. Between the 10 people who work in those two offices, TigerBlog counts 13 children. There are at least 20 between the people who have the word "athletic director" in their titles. There are more little kids than older kids, it seems. It's like an army of them sometimes. Yeah. The more TB thinks about it, the more he likes the idea of a group picture of all of the kids of the people who work here. At the very least, he'll try to figure out how many kids that wouldn't be in total. Has to be at least 200, he'd think. Speaking of families, the Princeton athletic family will be growing shortly with the addition of the Class of 2021. Wow. The Class of 2021 already? TigerBlog has started to get the emails that are automatically generated whenever a coach adds a player to a roster, or, for whatever reason, takes one off. These emails come sort of randomly during the year, like when someone quits a team or withdraws from injury or something like that. And then they come flying at TB in bunches, when coaches add incoming freshmen to the roster. If he gets one for a larger-rostered sport, like track and field or football, then he knows that once he's gotten one email, then the flood will be starting. Each of these emails, of course, is a different player, with a different story and a different path to Princeton. In the case of the incoming freshmen, they're home right now, in all likelihood, figuring out what they need to buy, what they need to bring, what to expect when they get here. From the time they arrive, the Princeton experience will start to grab them. They will hear "Class of 2021," and probably "great Class of 2021," about 2,021 times before they ever go to a class. For the athletes, they'll be meeting teammates, getting settled into their team's routines and cultures and starting down the path that will lead them, hopefully, to the 2021 senior banquet, all having had great, winning, championship athletic experiences with corresponding educational success, with time left over to give back to the community. You know. Achieve, Serve, Lead. For now, they're still with the high school friends, or on vacations, or working summer jobs - or all of the above. Shortly, very shortly, they'll be here, no longer just names on emails, as their Princeton time starts to come to life. Ah, to be young, right? John Mack, the 10-time Heptagonal track and field champ and 2000 Roper Trophy winner, texted TigerBlog yesterday and asked about Princeton athletes who had had injuries that "derailed," to use his word, their careers. He was referring to the John Lovett news from the other day, the news that said that Princeton's Bushnell Cup winner and first-team All-America from a year ago would miss time this season after surgery. TigerBlog quickly mentioned Mason Rocca, the men's basketball player. Then he gave John Mack another name: Dave Splithoff. One of the most amazing moments TigerBlog has seen in all of his time covering Princeton sports was the 2000 Princeton-Colgate football game. There are actually two things TB remembers from that game. The first was when he tore his Princeton lacrosse pullover in the press box after he caught it on a nail. That was a nice one too. The other is the way that Splithoff, then a freshman, put together two of the most incredible drives you'll ever see in football. Splithoff had never taken a varsity snap. He was only on the trip because of injuries and, if TB recalls correctly, he was the emergency punter. With the Tigers down 34-0, Splithoff was given a chance in the fourth quarter. He stepped onto the field, and immediately he became Tom Brady, or Joe Montana. First he took Princeton 80 yards, on 13 plays, for a touchdown. There can't be too many drives quite like the next one he engineered. When he came back on the field, now down 34-6, he was backed up to his 1. As in one-yard line, three feet from his end zone. Sixteen plays later, Princeton was on the Colgate 1, having traveled 98 yards. That's where the drive ended, on a fourth-and-goal, with no points. The next week against Brown, in his first start, Splithoff first broke the school record for consecutive completions with 14 and then threw for 289 yards and three touchdowns in a 55-28 win at home. Splithoff, whose consecutive completions record has since been broken by Quinn Epperly with a ridiculous 29 straight against Cornell in 2013, became the first freshman ever named Ivy League Offensive Player of the Week, and he added the ECAC Offensive Player of the Week award as well. The next weekend, he ran for three touchdowns against Harvard - and then broke his jaw on the final play of the game. It was never the same for him after that. He's still 11th all-time at Princeton in career passing yards, but he would get hurt again, a shoulder TB thinks, and finish his career as a defensive back. For those three games his freshman year, though, Splithoff was electric. For those three games, it looked like the future of Princeton football was being built around this freshman quarterback, the one who played with charisma and style and skill and fearlessness. And then he was gone. TigerBlog remembers the conversation the Monday after the Harvard game, when the news first came out that Splithoff had broken his jaw and was done for the year. It was like a cruel joke. The 2017 Princeton Tigers are deeper than just Lovett, of course. There all kinds of pieces back from last year's championships season, and when the preseason poll came out yesterday, there were the Tigers, tied with Harvard at the top. It was hardly a consensus vote. Princeton and Harvard both had 120 points, with Princeton with six first place votes to five for Harvard. Penn was in third, but a close third, with five first-place votes. Brown was sixth, but the Bears did get one first-place vote. Of course, for preseason polls, it's best not to put too much faith in them. Princeton has won league championships more than once when picked to finish sixth. Hey, it's not even time practice to start yet. There is such a long way to go between now and November. Does the poll tell you anything? Only that nobody is a sure thing. Well, Splithoff might have been actually. Until the injuries came along. But that doesn't shortchange the impact he had on Princeton football. He was part of something amazingly special during those three weeks his freshman year. The drives against Colgate were the appetizer. The game against Brown, he simply dominated from start to finish. He was just an inexperienced freshman, a boy among men, but a boy that none of the men could handle that day. The game against Harvard he kept Princeton in, and then that was that for the year. It's not always a fair game, football. So yeah, John Mack. Dave Splithoff. There's an answer to your question. TigerBlog's first football exposure for 2017 was to watch the first episode of Season 2 of "Last Chance U." If you don't have Netflix, you're missing out. That's where the best shows are these days. "Last Chance U" is the story of the football team at East Mississippi Community College, located in the town of Scooba, which is about 50 miles east of Philadelphia, the one in Mississippi. It's also 1,000 miles south of the Philadelphia in Pennsylvania, and seemingly even further than that - at least figuratively - from the big-time Power 5 football where many of the players at East Mississippi started out and how to get back to at some point. The school is up front about what it's doing. It's taking players who have all the football talent in the world but are not on major Division I rosters for any number of reasons, mostly including academic or legal issues. East Mississippi is trying to turn them around, get them back to Division I and win some football games in the process. The first season of the series was a pretty fascinating look into the dynamics that exist at the school, and it made stars out of the coach and some of the players and especially the woman who worked tirelessly and endlessly in the academic support role. Season 2, at least through one episode, seems like an extension of the first, only with different faces on board. And, TB believes, the woman leaves her role at the school. And, interestingly, the first five minutes introduce all of the new faces - and show why they had to leave where they'd previously been playing. It continues to amaze TigerBlog the way so many shows are on TV these days in which relatively unimpressive, unaccomplished people have cameras following them around and all of the sudden they achieve fame, notoriety, wealth and everything else, without anything that really distinguishes them. TigerBlog usually isn't a fan of such shows, but he likes "Last Chance U." Maybe it's because it's about a college football team? Maybe it's because there isn't a whole lot of pretense to it. On the other hand, imagine if you had cameras that followed you around all day and then had that broadcast on television, followed by instant fame as everywhere you went people said "hey, there's that person from that show on that channel." Wouldn't it make you feel fascinating? How would TB react if there were cameras in his office all day recording his every move? Coming up next week, watch TigerBlog eat his tuna and avocado sandwich - and then everyone did, and found it to be great television. Anyway, the head coach of the team seems to be the one most aware that cameras are everywhere. The rest of them just go with the flow. If you've never seen "Last Chance U," check it out. TigerBlog has also watched "Ozark," which was okay, and tried "Gypsy" but never got into it. He's heard "Orphan Black" is good. "John Lovett had surgery during the offseason, which stemmed from an injury he played with during the 2016 season and, unfortunately, did not completely heal during the offseason. The surgery was a success, and he will miss time this fall. He will continue to be a tremendous leader for our team, and we look forward to his healthy return to the field." Lovett had quite a 2016 season, when he was the Bushnell Cup winner as the Ivy League Offensive Player of the Year and a first-team All-America. He had ridiculously insane numbers, with 20 rushing touchdowns (and at least one in every game) and 10 passing touchdowns, with one receiving TD tacked on. Those 31 touchdowns are a Princeton single-season record. They're also more than five league schools had last year. Keith Elias is the most dominant football player that TigerBlog has seen at Princeton. Lovett last year approached that level of dominance, in a different way, but on the same level. With Lovett's versatility, Princeton's offense led the Ivy League, and the Tigers went 8-2 overall and 6-1 in the Ivy League, sharing the championship with a Penn team Princeton beat 28-0. In that game, Lovett ran for one TD and threw for another. Princeton has played a very unique style of offense the last few years, especially with its use of multiple quarterbacks. Chad Kanoff is back for 2017, but Princeton is in the strange position of having only one of its quarterbacks available now, as if they were cornerbacks, not quarterbacks. Plus, Lovett is an incredibly exciting player to watch. You never know what he's going to do, but he's usually going to be the focal point of every play. And he's awesome in short yardage situations - not only the ones that took him into the end zone 20 times but the others that kept drives alive on third and fourth downs. But hey, that's the nature of football. You have to be ready if someone is unavailable. TB is pretty sure Surace and his staff have a Plan B in mind. At the same time, TB feels badly for Lovett. He had to be primed for a big 2017, and now that's been pulled out from under him. In football, you need that "next man up" mentality. You also need to remember the last man. What he's going through isn't easy - and TB hopes he can get back quickly. TigerBlog spoke to Mark Eckel over the weekend after he wrote about his retirement this past Friday. Mark wanted to know how TB remembered the story about how Mark had said he was going to write a game story and a column about Gabe Lewullis after Princeton beat Penn in the 1996 Ivy men's basketball playoff game. TB responded that he remembers everything. Maybe not everything. TigerBlog, though, does have a good memory. Maybe it's because he likes to do puzzles. Keeps the brain stimulated. Mark told TigerBlog something he'd never mentioned before. He said that the playoff game in 1996 was one of the two "craziest" nights he's had in the business. The other one, he said, was the "Fog Bowl" that the Philadelphia Eagles played against the Chicago Bears at Soldier Field on New Year's Eve 1988. The fog that rolled in that day limited visibility for the NFC playoff game to absurd levels, but the teams played through it. Chicago won the game 20-12. TigerBlog's memory of seeing the game was not being able to see the game because of the fog. It was, as Mark said, definitely crazy. He didn't remember that Randall Cunningham threw for 407 yards in the game. Hey, TB never said he remembered every detail of everything. Just most. One thing TigerBlog didn't mention about Mark was that in addition to all of what he covered, including Super Bowls and Stanley Cup finals, he also covered a lot of women's athletics and did a lot to promote women's athletics at a time when not a lot of male sportswriters did. Princeton, of course, has one of the best women's athletics programs in the country. It is a place of equality of opportunity, and it's a university and a department that takes huge pride in the accomplishments of all of its athletes, regardless of gender. The current Courtney Banghart "10 on 10" series that is reviewing the women's basketball coach's first 10 years at Princeton is the product of TigerBlog's colleague Warren Croxton. Warren, by the way, has successfully completed one full year of marriage, so congrats to him and his wife Michelle. The series is focusing on the major storylines of Courtney's tenure to date. For all of her on-court success, and there's been a lot of it, maybe her biggest impact is something that TigerBlog has said many times before - the way she has grown the fan base for her program to include a large portion of men and boys. It's true of a lot of Princeton sports. Hockey. Lacrosse. Soccer. Field hockey. So many. There are way more men watching women's teams play now than there were when TigerBlog first started out. That's for sure. This past year as an extraordinary one for Princeton women athletes. The 10 finalists for the von Kienbusch Award were a wildly remarkable group, easily the deepest and best that TB remembers. Two of those 10 had big weeks this past week as they continued their athletic careers post-Princeton. Tyler Lussi scored the first goal of her professional career, with a goal in the 39th minute that would be the difference as her Portland Thorns defeated Houston Saturday. Lussi, the all-time leading scorer in soccer at Princeton for men or women, fought her way through a crowd in the box and knocked a right-footed shot into the goal. Meanwhile, if you went east instead of west from Princeton, you could have found Julia Ratcliffe, who was competing for New Zealand in the World Championships of Track and Field in London. Ratcliffe, a 2020 Olympic hopeful, finished 25th in the women's hammer throw. That's in the entire world, which is, you know, really impressive. Lussi and Ratcliffe followed Olivia Hompe, who had a huge World Cup tournament this summer for the English women's lacrosse team. The list of Princeton women's athletes who are succeeding way beyond Princeton is very long indeed. As for the track and field championships, assistant men's track and field coach Robby Andrews runs in the 1,500 Thursday. Oh, and Usain Bolt lost. Finally. Bolt, who won the 100 and 200 and was on the winning 4x100 relay team at each of the last three Olympic Games, is one of the most dynamic athletes TigerBlog has ever seen. Usually you want to root for the underdog. In the case of just a few athletes all time - you know, like Michael Jordan - you root for their greatness, for the opportunity to see the very best ever in their primes. Bolt has been one of them. And so what that he lost at the World Championships. It changes none of that. So anyway, here's to your marriage Warren. May it be the first of many. Oh wait. That's not right. But hey, you know what TigerBlog means. TigerBlog begins the first Friday in August by congratulating a pair of Marks. First, there is Mark Eckel. If you're a fan of the Philadelphia Eagles, or a Princeton fan going back 20 or so years, then you know the name. Mark has been a longtime fixture in Trenton area sportswriting, beginning back when he was a high school student at St. Anthony's, which became McCorristin, which became Trenton Catholic. There aren't many people who have spent more time involved with sports in the Trenton area. Now his new home is in Myrtle Beach, in a condo overlooking the Atlantic Ocean. He has officially retired. Princeton men's lacrosse coach Matt Madalon likes to talk about how he had every job on the coaching ladder, starting out as a volunteer, before he became a head coach and how valuable experience like that can be. Mark is the sportswriting equivalent. He covered high school sports for a long time in the Trenton area. And Little League and Babe Ruth and American Legion and everything else. He had just moved up to cover some pro stuff, like the Flyers and Eagles especially, when TB first started in the newspaper business, back in the early 1980s. The Eagles would become his primary beat, and he is an authority on how to cover an NFL team. He clashed with coaches, players, front office personnel and other media members, but there's not a person associated with the Eagles for the last 30-something years who doesn't have equal parts respect for and funny stories involving Mark during his tenure. Well, maybe one person. Rich Kotite. Mark has been a fixture on Philadelphia sports talk radio and television. He's written books about the Eagles. Mark also covered a ton of local college events, especially here and at Rider. He was on the Princeton beat for men's basketball and men's lacrosse during the glory days of the mid-1990s. He was there the night Princeton beat Penn at Lehigh in the 1996 in the Ivy League playoff game for the NCAA bid, and he was there five nights later when Princeton beat UCLA in Indianapolis. It was his story after the Penn win that had the famous headline: "Princeton Wins, Carril Quits." Back on that night, TigerBlog was the first one in Princeton's lockerroom other than Pete Carril, and TigerBlog was the first one who saw that Carril had written on the chalkboard that he was retiring. A few seconds earlier, before he walked into the lockerroom, TB had been talking to Mark, who outlined for him that he was writing two stories, a game story and a column on Gabe Lewullis, then a freshman who had a huge game for Princeton, right near his hometown of Allentown. Gabe, by the way, is an orthopedic surgeon today. When TB came out of the lockerroom, Mark asked him if he was getting Lewullis for him. "You're not writing about Lewullis," TB said. Then, when Carril made his announcement to the media about his retirement in the next few minutes, Mark, seated in the front, turned around to look at TB and laughed. Mark loved to cover Princeton. He's always talked about what a great change of pace it was for him from the Eagles. He loved lacrosse, a sport he had no knowledge of prior to connecting with the Tigers and Bill Tierney. He loved Princeton basketball, and all of the coaches who followed Carril. Some of TigerBlog's best memories of his tenure here have been the long road trips to and from Princeton basketball he'd make with Mark, and Tom McCarthy. He's not the warmest and fuzziest guy you ever met. He is among the funniest. He's also loyal, and he's no nonsense. There's nothing phony about him, that's for sure. There are no current Princeton athletes who have ever been interviewed by Mark Eckel. It's been awhile since he's been around here. He has to be in the top 10, though, of people who have written the most in newspapers about Princeton Athletics. He's in the top five since TB has been around, that's for sure. And congratulations to another Mark, this one Mark Miyashita, who is leaving Sacred Heart University to become the head men's lacrosse coach at his alma mater, Canisius. Miyashita - Coach Sheets, as he is known - did a lot to help turn the Pioneers program around. He's also done a lot for TigerBlog Jr. in his adjustment to college lacrosse and development as a college player and a college student. It's great to see him get his first head coaching chance. He's one of those guys you meet who just impresses you from the start with his demeanor, intelligence and passion. Congrats to that Mark as well. As for the rest of today, there are three weeks until the first Princeton game of the 2017-18 academic year. Three weeks. That's a bit insane. And it's another summer weekend. Enjoy it.